Wow - we're at the end of April already! I can hardly believe that we're heading into May. Have you done your taxes yet??? That is on my agenda in the next couple days! I've got a lot of things to do this week, so I'm trying to keep the meal plan fairly simple and easy to stick to. You may be getting sick of me eating this, but I love this salad and it's great because it's easy for me to throw together after my belly dancing class!! 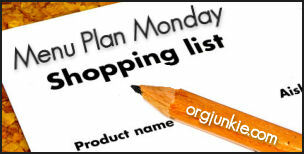 As always check out Org Junkie for lots of meal planning ideas and recipes! Hi My name is gloria and frankly I have been stumbling a lot through life with an auto immune disease I have known for some time that I need to be on a gluten free diet so I am hoping to learn all that I can from woman like yourself who have adopted this die.